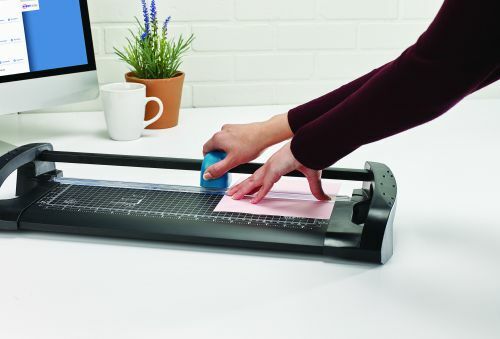 The Avery Office A3 Paper Trimmer is lightweight but strong and sturdy and cuts through 12 sheets of 80gsm paper at a time with no difficulty, ideal for everyday cutting in the office and home. Its easy to store either flat or upright, with handles for safe portability. The stylish design in black and teal colours works well in any environment and with its clear baseboard markings for paper and photo sizes, imperial and metric measurements makes cutting more precise. The blade is self-sharpening too and is enclosed in a comfy ergonomic cutter head, nice to hold and smooth to cut. Our trimmer comes with a 5 year guarantee with replacement spares for this time too. It has the TUV GS and BS marks, which ensures it is manufactured to the highest quality and safety standards.